Discussion in 'Motorsport' started by GTPNewsWire, Sep 15, 2018. This article was published by Joe Donaldson (@Joey D) on September 15th, 2018 in the Motorsports category. IngRobNy and baldgye like this. Don't get me wrong, I completely understand that this is the future of racing, and that this will surely help development of road-going cars. I can't wait until we see track records being broken by E-cars, and that they'll provide the same (ish) entertainment as F1 does. I understand that the wheels are not the most aerodynamic part on a car, so they need to be covered as much as possible, but this Gen 2 package is not an Formula racer. This is stunning. A shame that there's no twin kidney grilles though, even in decal form like BMW Williams had in F1 back in the day. Besides that I'm liking the design and futuristic livery! I mean, what's the next evolution? Moby45 and Ether like this. CTstryk, IngRobNy, ThePotatoKing and 1 other person like this. 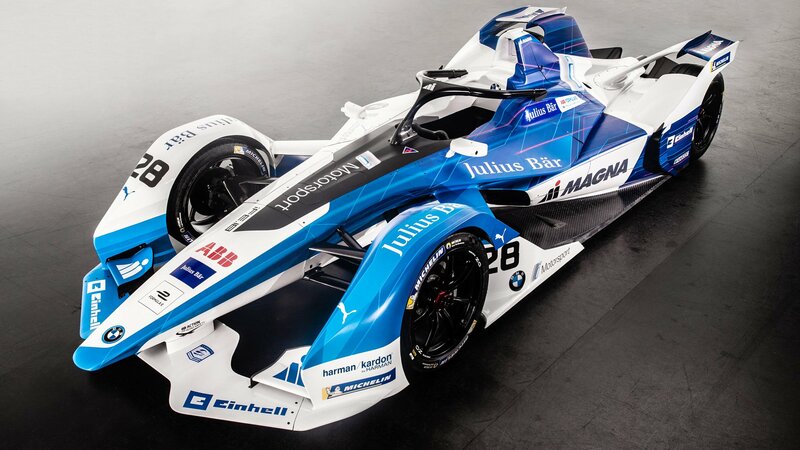 I would love to start following Formula E but I can’t until they start running on real race tracks, street circuits are not entertaining to watch. Nice looking race car, and I agree It even makes the hideous halo look good. IngRobNy and VBR like this. Wonder if they'd do a night race. Looks like headlights could be fixed on the front fender there. I always wondered why Formula E was featured in the Gran Turismo Sport Museum, but not in the actual game. Hopefully it will come soon enough. They don't need headlights for driving when it's dark, if you watched Singapore F1 yesterday, you would see they drove at night without headlights, the track was lit up more than good enough for the F1 drivers . I was sure I found a 2018 picture , but at least the light is the same as the 2018 race . I really like the ways these look! Except for that stupid halo thing, just make it a covered cockpit already. Most of the car looks like a LMS car anyway. I disgree, Street circuits are really fun to watch! It also makes the races more accesable to locals. My problem with Formula E though is the fact there is no engine sound. I tried to watch some races, but it is almost like watching these races with the tv on mute, it becomes very boring after a while. VincentVendetta and Moby45 like this. I tried to watch some races, but it is almost like watching these races with the tv on mute, it becomes very boring after a while. Indeed. I know it sounds petty or silly but hearing the cars engine is a great part of the experience live. FE makes me feel like I am watching remote control cars which just makes me feel unfulfilled. But be that said, I know how spectating and driving are two separate things. I run a miata at the track. In my class here locally there are maybe 8 of us all miatas. To us while on the track the racing is intense and thrilling. But sometimes it looks kinda boring from the outside lol. Unless we are just putting on a great show. I am sure formula E is fun to do, just bleh to watch. No doubt it is fun for the driver. But seeing it is so underwhelming to watch. I would almost suggest amplifying the sounds the cars do make (not talking about fake sounds) to make it more exciting for the viewers and public. I have never been to one, but I imagine you can actually hear yourself talking and can talk to each other in a normal tone. The quote below, is what I was thinking about. This is the 2014 GP - cars look very different now, but the essence of your post is absolutely correct. Why bother with headlights if you can make the entire complex light as day. Of course, Formula E might be against that because of the whole "lets be green" mentality, but that's just assumption. Afaik, with the Gen2 cars, they'll be racing on the full Monaco GP circuit unlike the previous seasons. It'll only be a matter of time before outings to actual full tracks happen. Overall, FormulaE seems a little gimmicky to me at the moment. That said, it has been great fun keeping up with the results , recaps and developments in the past few years. They still have a bit of work to do with their format before they become a "must watch every race" series, but the premise is there. Unlike a lot of new lower catergories that get placed into an already existing pile of series, the interest was immediately there because of the tech. Finally, I'd like to add that in most Formula categories, manufacturers are seen as a two-fold edge. This is different in F:E because the manufacturers are literally beating each others heads in to get grid slots instead of the usual amount of two or three that dictate a whole series.